Once again, a major hospital in Israel is filled past capacity and temporarily closed to Magen David Adom ambulances: Rambam Hospital in Haifa. Once again, a major hospital in Israel is filled past capacity and is closed to Magen David Adom (MDA) ambulances. 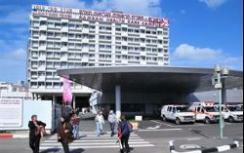 The Health Ministry allowed the closure in northern Israel’s largest hospital, Rambam in Haifa, from noon on Tuesday. The closure was announced for three hours, but was then extended until 4 PM. Patients who arrive on their own at the hospital’s emergency room will not be turned away. However, the management has asked that people go instead to the smaller nearby hospitals of Bnei Tzion and Carmel. The hospital is currently operating at 140% capacity, and not a single bed is free; many admitted patients have no bed. A hospital spokesperson told Israel National News that while the normal number of patients in the internal medicine departments is 177, given the amount of nurses, "today we have 250 – so that gives you a picture of what is going on here." Just three weeks ago, for similar reasons, the Health Ministry instructed MDA not to send patients to three hospitals around the country – Sheba/Tel HaShomer, Barzilai in Ashkelon, and HaEmek in Afula – for a full day. The management of Sheba/Tel HaShomer Hospital asked the Health Ministry and MDA this month not to send patients its way for three evenings a week. Some 75,000 people are hospitalized in Rambam Hospital every year, and another 500,000 are treated in its outpatient clinics and medical institutes. The medical center comprises 36 departments with close to 1,000 beds, 45 medical units, 9 institutes, 6 laboratories and 30 administrative and maintenance departments. Additional buildings are under construction, including an underground wing that will be protected from enemy rockets, that are launchable from the Lebanese border less than 40 kilometers (25 miles) away. For a list of hospitals in Israel, click here.